and Jamie Farr, who played Max Klinger. He will go down in television history as the man who played Colonel Sherman T. Potter in "M*A*S*H", but Harry Morgan did more in the 1980s once that iconic role ended. Harry Morgan died recently, at the age of 96, and I will always remember what came after "M*A*S*H", right through the 1980s with more recurring roles in TV series. By the 1980s though, his career was reaching its zenith. The decade opened with Harry Morgan winning an Emmy for his role as Colonel Sherman T. Potter in "M*A*S*H". Oddly, he had appeared as a guest star in "M*A*S*H", before joining the cast full time in 1975, replacing McLean Stevenson, who had played commanding officer Henry Blake. It was one of the most popular sitcoms in history, and its series finale is still one of the most-watched events in television history. As M*A*S*H was winding down, most of the actors were ready to move on to other things. However, there were three cast members who wanted to keep on going once the show ended in 1983. 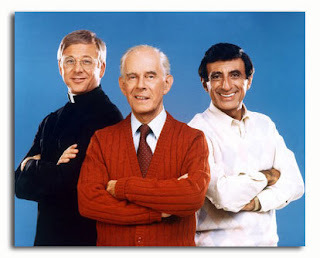 Those three actors were William Christopher, who played Father Mulcahy, Jamie Farr, who played Maxwell Q. Klinger, and Harry Morgan, who played the Colonel, Sherman T. Potter. The result was a spinoff featuring these three characters, fittingly called, “After M*A*S*H”. It was set in a veterans’ army hospital, and it debuted on Channel 7 of peasant vision in the fall of 1983. It did well in its first season, finishing 10th in the Nielsen’s series ratings, when it was in the same time slot as M*A*S*H was. However, in the second season it was put up against “The A-Team” which was a ratings juggernaut at that time on Tuesday nights, and lasted just nine episodes before it was cancelled. There were some references to M*A*S*H, including Radar making an appearance as well as the mysterious Colonel Flagg. There were also some new characters, such as Gene Pfeiffer, a resident surgeon, played by Jay O. Sanders; secretary Bonnie Hornbeck, played by Wendy Schaal; and joining the cast part way through the first season was Dr. Boyer, played by David Ackroyd, who was a bitter doctor who lost a leg in the Korean Conflict. To be honest, I was interested in the show just to see how the characters carried on. After that novelty wore off, it really wasn’t that interesting. After all, it featured probably the three least interesting and compelling characters from M*A*S*H.
So, by the middle of 1985, Harry Morgan’s turn as Sherman T. Potter, had finally come to an end. He would not be out of work long. Hal Linden, in "Blacke's Magic". While M*A*S*H was winding down on CBS, over on ABC a year earlier another iconic sitcom had come to an end – “Barney Miller”. Hal Linden had played the title character for eight seasons, and had become synonymous with the role. I was in Grade 11, second semester, when I saw the trailer for a new TV show, from the creators of “Murder, She Wrote”. It was called “Blacke’s Magic”, and starred Linden as professional magician Alexander Blacke. Playing his con man father Leonard was none other than Harry Morgan. Unlike the upstanding and law abiding Sherman Potter, Leonard Blacke was a little shadier and much looser with the law. I thought with these two stars, and the creative team of Richard Levinson, William Link, and Peter Fischer, “Blacke’s Magic” would be a hit for sure. However, that was not to be the case. 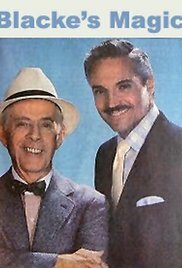 After just 13 episodes, “Blacke’s Magic” was cancelled, and Harry Morgan was done with network TV. 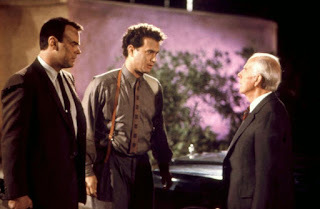 Dan Aykroyd, Tom Hanks, and Harry Morgan. Morgan had achieved acclaim with a revived version of "Dragnet" which ran from 1967 to 1970, were he played Bill Gannon, Joe Friday's partner. In 1987, a new "Dragnet" movie was released featuring Dan Aykroyd and Tom Hanks. Morgan reprised his role as Bill Gannon, who by this time had been promoted. He would continue to act until the end of the 1990s, capping off a long career that began in the 1940s. M*A*S*H was one of the most iconic TV shows of the 1980s. It evolved over time from a slapstick comedy, centering on the slapstick antics of Trapper John, Hawkeye Pierce and their hapless victim Frank Burns. It evolved into a comedy that would delve regularly into dramatic, and sometimes quite dark, situations. About the time it became more serious coincided with the arrival of a new commanding officer, Colonel Sherman T. Potter, played by Harry Morgan. He would provide the anchor for the show, playing a fatherly figure for everyone else, and was rewarded for his efforts with an Emmy in 1980. His work in the 1980s peaked with M*A*S*H. He gave the same character another turn in a new setting, but it was just not the same. Without strong, dynamic characters around him, he just was not the same Sherman Potter in peace time as he was in war time. Even venturing out into new territory, playing an elderly con man with a golden heart, was just not the same. Colonel Potter is what I will always remember about Harry Morgan, that portrayal of the wise, father figure who remained calm in times of crisis and always provided sage advice. He could also take a joke, and surprisingly give it back, playing one or two of his own.